Guess, what? I made you another cake! Well, actually I made this one a few months ago, but wasn’t happy with the pictures, so I never posted it. However, I have decided that I really must share this recipe with you and when I have some nice light, I will re-take the photos to my liking! 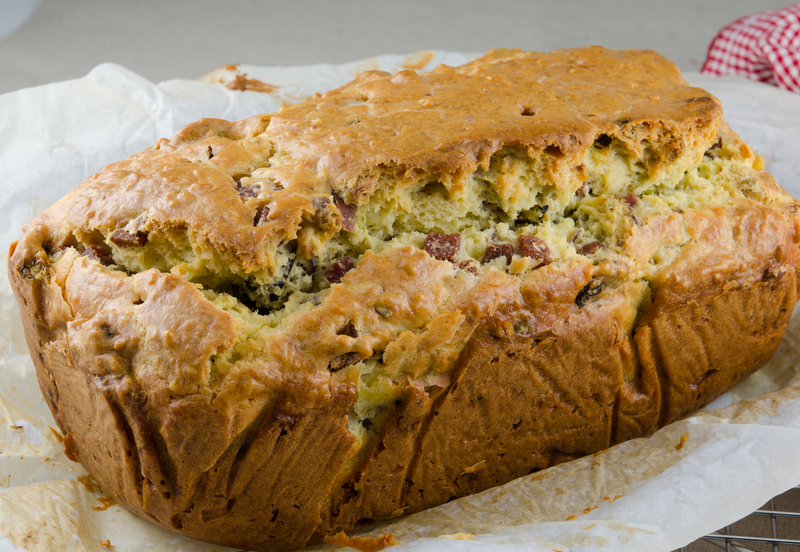 Now, about this cake… This savoury cake, from France, is nothing short of show-stopping! Until I read the recipe in Rachel Khoo’s, “My Little Paris Kitchen”, I had never heard of a savoury cake. I thought it might be a little like a bread – a zucchini bread for example, but it is quite different. 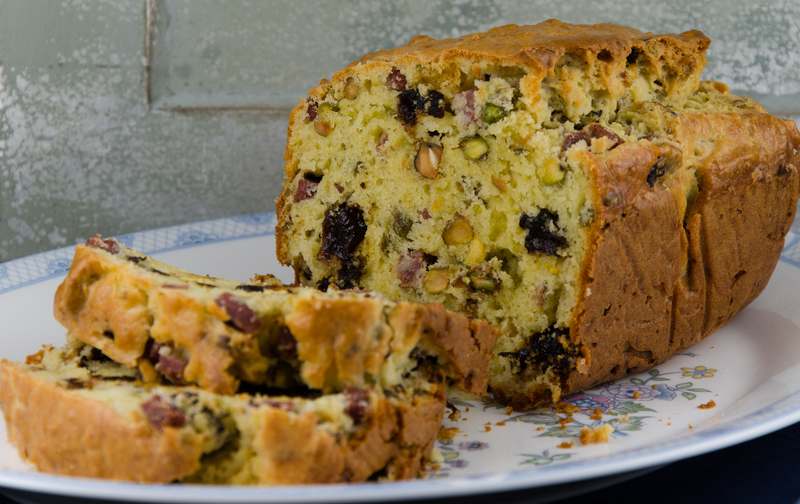 It actually has the texture of a nice cake, but it is filled with yummy savoury ingredients, like sausage and pistachios, sans the sugar. Rachel mentions in her cookbook that you could substitute whatever you like. Add some figs, goat cheese, and walnuts or whatever you have hanging our in your fridge. She says that this cake is very popular at picnics in France, but I served mine at a girls’ party that I hosted. The girls all gave it a huge thumbs up, as they polished off the whole cake, and all requested the recipe. So here it is, my friends: I hope you enjoy it! I am bringing over a warm loaf of this delight to Angie’s Fiesta Friday. Come and join us at the newest venue. We will be partying up a storm now that Angie has found us our own “party hall“! In a large bowl, mix together the flour, baking powder, sausage, pistachios, and prunes. In a separate bowl, whisk the eggs until thick and pale in colour. Gradually whisk in the milk, oil, and yogurt, then add the salt and season with pepper. Fold in the flour mixture, bit by bit, trying not to overbeat it. Pour the batter into the prepared pan. Bake for 40 – 45 minutes, depending on your oven. A metal skewer inserted should come out clean. Leave to cool in the pan. Slice carefully with a serrated knife. Lovely to take along on a picnic! Interesting! I love the idea of the saltiness the sausage must bring to the bread. It looks fantastic. Intriguing ! Looks so moist. Will try it. This is so funny, Julianna, my husband is reading this over my shoulder and you’ve now sparked a debate about savoury vs sweet! As far as he’s concerned a cake has GOT to be sweet!!! He can’t get his head round sausage in a cake….this from the man who used to eat lemon curd sandwiches with his prawn cocktail crisps!!!!! I know…this was some time ago, thank goodness he had better taste in women hey?! 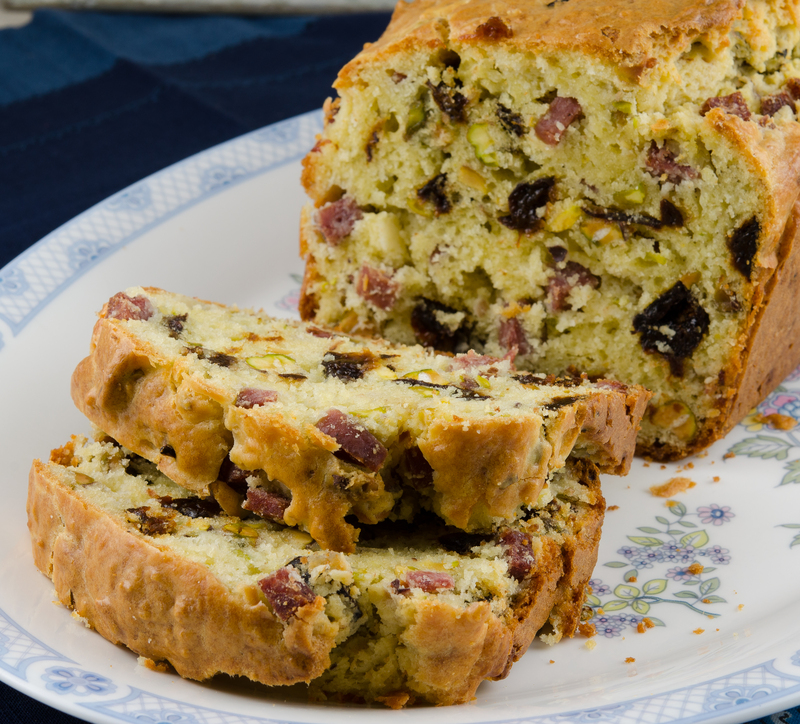 This is the second time in a week I’ve seen a recipe for a savoury cake, what a great idea! I’m not especially fond of sweets so this looks fabulous. Sounds delicious! Just my kind of flavors in there and love the pretty chunks. A tasty treat in each mouthful! Chef Juliana. I think this is a wonderful combination and so very creative. Would love a slice with eggs, I think it would be delicious. That’s what I call a great idea! Lot of yummy ingredients together, I’m sure it must be delicious! Thanks for being at FF! I saw the cake in her book and was intrigued – so glad you have road tested it out for us! Happy Fiesta Friday! I think the next cake I make will have to a savoury one! I love prunes, this looks delicious! I think you will really love this cake! The prunes are so nice in a warm slice! The ingredient list is so unique, Julianna. I imagine the flavors are wonderful together! It must taste wonderful fresh from the oven. 🙂 Love the idea of a savory cake! You bet, Nancy! I totally recommend that this be eaten warm from the oven … except that you won’t be able to stop eating it until it is all gone! Better make 2 – one for the chef, and one for the guests!! I will take your comment to heart!! Well, the pictures are awesome! And the recipe sounds totally delicious, I have to try it. Thanks for sharing. If it wasn’t finished, I would say, Please send me a slice. I love this cake!!!! Thanks so much Silvia! I am really glad that you are enjoying my blog! Let me know if you try any of the recipes and how they turned out! Cheers!